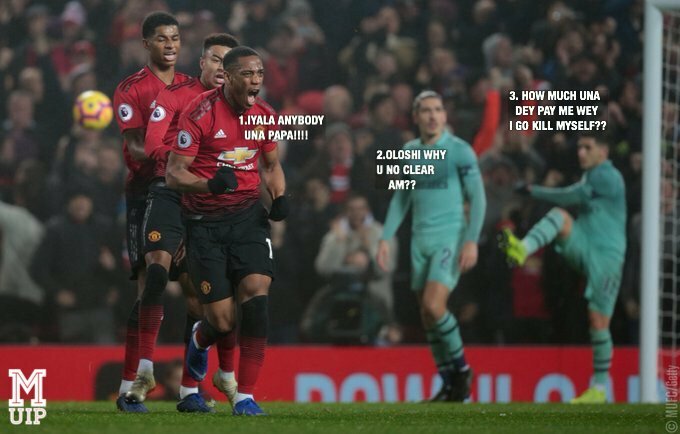 Manchester United don draw 2-2 against Arsenal for Old Trafford. Na Red Devils wey score the whole four goals: De Gea (own goal), Marcos Rojo (own goal), Jesse Lingard and Anthony Martial. Our next game na against Fulham, till then, make we talk about the five things wey we observe for the game. The first thing wey we observe na say Jose Mourinho bin fail with hin Fellaini substitution. I no sabi why e carry the traffic light enter pitch. The guy no do anything all, e suppose collect red self. Hin other subs no too impact the game but na Lukaku wey cause havoc for Arsenal defence, before Lingard equalize. Another thing wey we observe na say Manchester United dey shoot themselves in the leg and e dey cost them games. When the team dey play well, De Gea con put sand for their garri. For second half, e happen again but na Rojo cause am. If United fit reduce these mistakes, dem go rise for table. Another thing wey we observe na say Eric Bailly, Chris Smalling and Marcus Rashford bin get outstanding game. Fashi say Rashford bin do two assists against Southampton, hin performance tonight na hin best so far this season. Another thing wey we observe na say the formation wey Mourinho start tonight make brain. The 3-5-2. E make brain as Rojo bin dey overlap to help for attack. I dey impressed with am tonight. Also Dalot bin make many good forward runs for that right wing. I dey happy with their overall performance. Lastly, I believe say Arsenal bin get luck tonight as if no be for United’s mistakes, dem for no get ginger to play well tonight. I go gree say dem miss some fine chances but na the United own goals wey almost dash dem three points.